Researchers are able to link data from multiple providers, never seeing RawNHIs. Below is an outline of the flow of data and the process to supply and use eNHIs. When we talk about ‘both tables’ and eNHIs, we’re describing a set of ALL POTENTIALLY VALID NHIs within NZ. This is a set of all 13.8 million records which make up the whole set of NHIs which can ever be used. 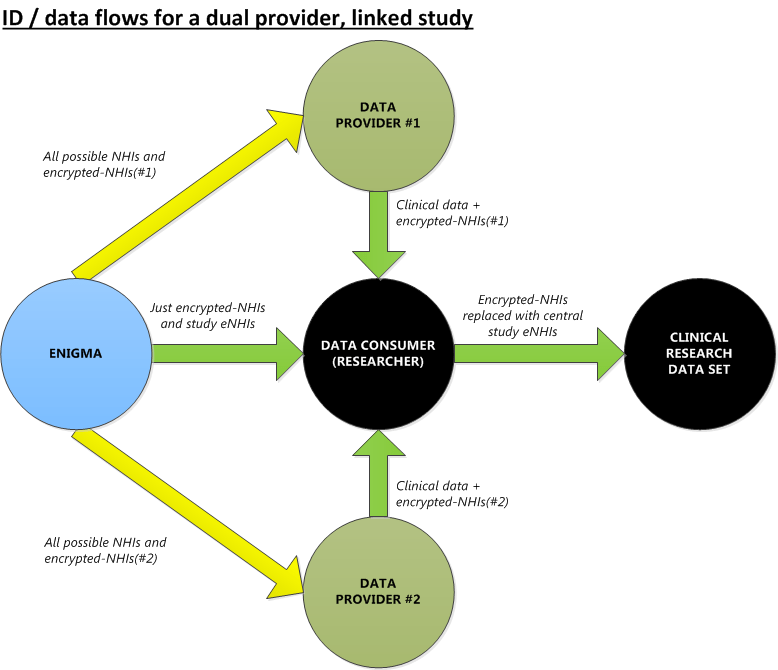 By taking this approach, Enigma is able to service the needs of the researchers and data providers up-front, as a one-off piece of work; from that point on no further work or interaction with Enigma is required (unless the number of data providers in a study extends). The data providers never have to release any data from their own control with Raw NHIs attached. The researchers never see any Raw NHIs. Enigma never has to see any patient id lists which might indicate who is included within a clinical data set. This is the gold-standard approach for supplying anonymised data, it protects all involved in the process and it enables multiple, anonymised, clinical data sets to be linked a research study. Data relating to National Immunisation studies. University of Auckland, School of Population Health. University of Auckland, Immunisation Advisory Centre. TESTSAFE, Auckland regional laboratory repository. Auckland and Counties Health – District Health Boards.